Still/But/Not/Realize/You/? and You Do Not _, But Still Realize That _ ? 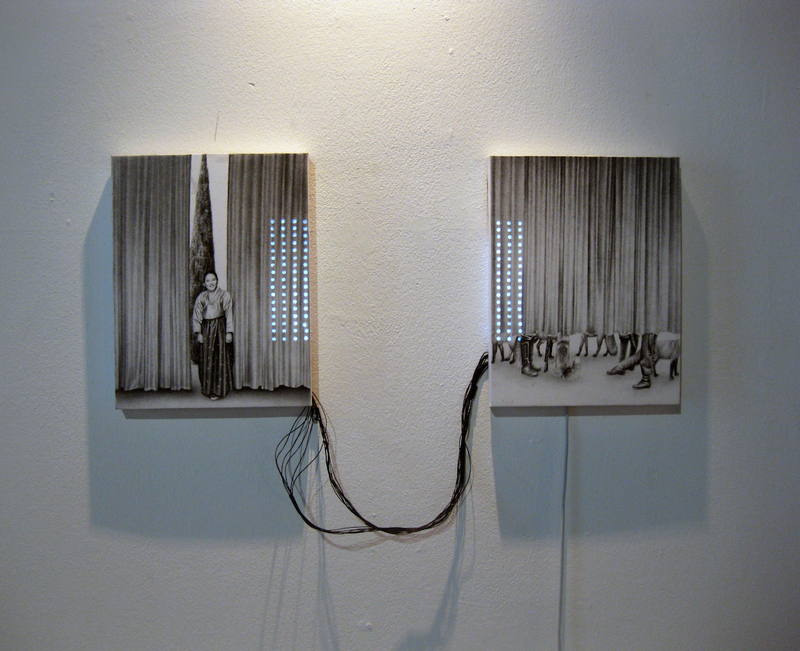 This project is about the Comfort Women issue between Japan and Korea consisting of two drawings as a set that are connected by rectangle lights moving between the two pieces. The Korean girl standing on the stage was a comfort woman. The Cypress on the back of the curtain indicates the death and sorrow that awaits her. On the other piece is legs of Imperial Japanese armies and foxes behind the curtain; who are not on the front stage and invisible, but in charge of everything in front. The rectangle lighting moving between the two pieces indicate a spot light or something that intertwines the front and the back.